This print represents a scene from the play Matazoro Shōroku Osakabe banashi (Shōroku's Revival of the Story of Princess Osakabe - 復再松緑刑部話) staged in the fifth month of 1814. One child was so frightened by the spectacle of the princess that he wrote: "I was so terrified [of the spectre] I tried to get away... It was awful not being able to escape because of the huge crowd." Quoted from: Kunisada: Imaging Drama and Beauty by Robert Schaap, p. 75. This is accompanied by color reproduction of this diptych from the Royal Museum, Brussels. 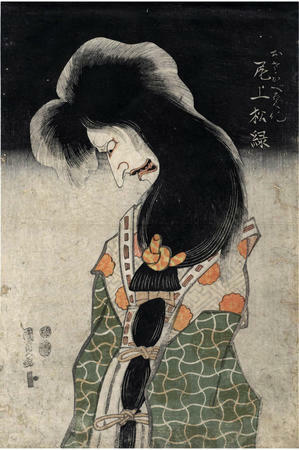 "Onoe Shōroku (1744-1815) was famous as a performer of ghost roles. Here he appears as the sixteen-foot-high apparition of Princess Osakabe.... The part of Osakabe required a great deal of strenuous physical action, and the seventy-year-old Shōroku was criticized for taking it on when he was past his best. This spectacular scene was performed in 5/1814. It tells the story of the ghost of Princess Osakabe haunting the warrior Hayakawa Takakage at Himeji castle. "One eyewitness account by a child included in a critique stated: 'I was so terrified [of the spectre] I tried to get away... It was awful not being able to escape because of the huge crowd." Quoted from: Kunisada: Imaging Drama and Beauty by Robert Schaap. The play became one of the ten favorite plays of the Onoe family, compiled by Onoe Kikugorō V (1845-1903) during the Meiji period (1868-1912) in reaction to the so-called Eighteen Plays (Kabuki jūhachiban) established by Danjūrō VII as the repertory restricted to the Ichikawa family." Quoted from Kunisada's World by Sebastian Izzard.